This is an excellent result, a modification by Horst Eckardt of the infinite energy condition found by Russ Davis. The m theory gives both superluminal motion and infinite spacetime energy from the same basic equations so goes far ahead of the standard model. This is an excellent group discussion. 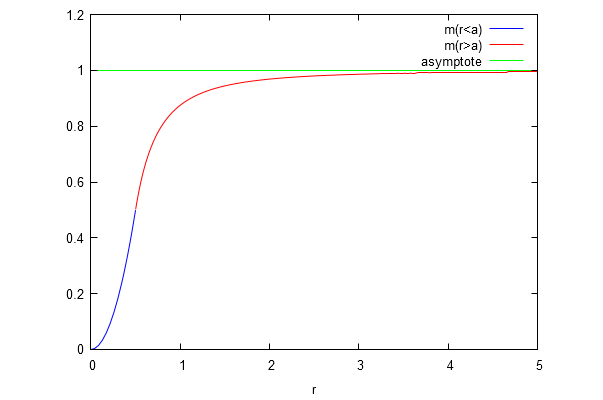 PS: This is an m function which is quadratic for r<a and of type 1/r^2 for r>a. I had to play a bit with the constants so that the transition at r=0 is continuous and differentiable. In the graph it is a=1/2. This entry was posted on October 24, 2018 at 4:47 am and is filed under asott2. You can follow any responses to this entry through the RSS 2.0 feed. Both comments and pings are currently closed.